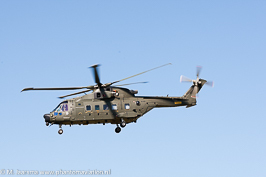 Company: Leonardo (until December 31, 2015: Agusta Westland, 2016: Finmeccanica). 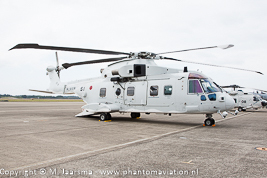 First designated EH-101 later redesignated as AW-101. On May 21, 2017 one of its AW101 crashed. Six of its EH-101 helicopters to the Royal Air Force were they were designated Merlin HC3A. Purchased 12 AW101s but program cancelled. Three helicopters stored in India, one returned to Agusta Westland, two to Nigeria. Includes two company aircraft (one written off and one preserved). 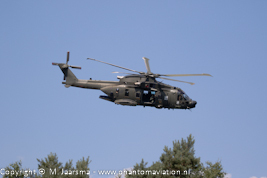 The Italian Air Force purchased six special operations helicopters designated HH-101A. Its first AW101 (0268) departed Yeovil on its delivery flight on November 17, 2017. One week later the helicopter - assigned to 330 Skv - rolled over during a test run. The AW101s are expected to be operational during 2018 with the last one to be delivered in 2020. The helicopters will be based at: Sola (2017 / 2018), Ørland (2018), Banak and Bodø ( 2019), Rygge and Florø (2020). The Royal Air Force took delivery of the Merlin HC3 and acquired six Merlins from Denmark which were designated Merlin HC3A. On May 25, 2018 the Royal navy took delivery of its first Merlin HC.4 of which 25 will be delivered. For details see below. Externally it be can recognized by a refuelling probe simular to the Italian HH-101A. All remaining operational Merlin H.3s were transferred from the Royal Air Force to the Royal Navy. Merlin HM.1 44 Royal Navy standard model. Merlin HC.3 22 Royal Air Force standard model (transferred to the Royal Navy). Merlin HC.3A 6 Ex Royal Danish Air Force EH-101s modified to RAF standard. Merlin HC.4 19 Royal Navy upgraded Merlin HC.3s (folding rotor head, Merlin HM.2 cockpit). Merlin HC.4A 6 Royal Navy upgraded Merlin HC.3A (folding rotor head, Merlin HM.2 cockpit). Danish Air Force EH101. 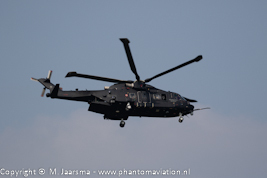 Karup air show June 2014 Italian Navy EH101A. APROC 2018 Gilze-Rijen June 4. Italian Air Force HH101A. APROC 2018 Gilze-Rijen June 4. Japanese Maritime Self Defence Force MCH-101. Hyakuri October 19, 2008. 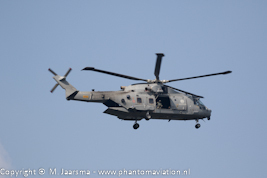 Royal Navy Merlin HC.3A during APROC 2018 Ederheide June 6. 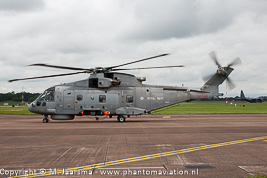 Royal Navy Merlin HM.1 departing RAF Fairford, RIAT 2012.